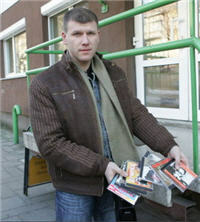 Following an undercover police investigation, the Vice President of Lithuanian Anti-Piracy Association LANVA has pleaded guilty to drug trafficking charges. Vytas Simanavicius, known for his efforts to curb online piracy in the Baltic country, faces up to eight years in prison. Because of the looming incarceration, his role as an expert witness in a Microsoft court case against a local BitTorrent site has become uncertain. For years LANVA has fought legal battles against BitTorrent sites and their users, but now the head of the organization has found himself caught up in a criminal court case of his own. Vytas Simanavicius, the 43-year-old Vice President of the anti-piracy group, pleaded guilty to drug trafficking charges this week. February last year the Organized Crime Investigation Board launched a pre-trial investigation into Simanavicius, suspecting that he was involved in the drug trade. In the early stages of the investigation the LANVA boss’s girlfriend provided information to the police. The local authorities then decided to put him on surveillance for six month. Eventually a sting operation was launched, using an undercover police woman posing as an interested buyer. The agent recorded a conversation about drug prices with Simanavicius, who further revealed that he obtained the drugs from a connection in the Netherlands. The undercover agent also bought drug samples from LANVA’s president, who allegedly intended to acquire bigger batches. According to the police investigation the drugs were not of the best quality, and the anti-piracy chief did not present a bigger batch of drugs because he failed to raise enough funds. When the facts were presented in court this week Simanavicius pleaded guilty to drug possession, with intent to distribute. If convicted, the offenses could result in a two to eight year prison sentence for the anti-piracy chief. In recent years the LANVA anti-piracy group has teamed up with the police on many occasions, and Simanavicius built quite a track record of legal proceedings against BitTorrent sites and users. In 2009 LANVA reported the IP-addresses of 106 users of LinkoManija, the country’s largest BitTorrent site, to the police. At the time the anti-piracy group claimed that the site’s users were sharing a copy of the Windows 7 Ultimate operating system. One BitTorrent user was eventually taken to court, but the case was dismissed due to lack of evidence. In 2010 LANVA teamed up with software giant Microsoft again to sue the operator of LinkoManija. Microsoft demanded $43 million from the defendant and his company for assisting in the illegal distribution of its software. This case is still ongoing, but it’s unlikely that Vytas Simanavicius will stay on as an expert witness. Similarly, the anti-piracy group LANVA will have to look out for a new boss if it wants to continue its work. c There are 90 comments. Add yours?